‘You Only Live Twice’ is probably the first Bond in the series where the formula starts to feel a little tired, with Connery not quite as strong in the lead role and the overall plot not nearly as compelling as the previous films in the series. 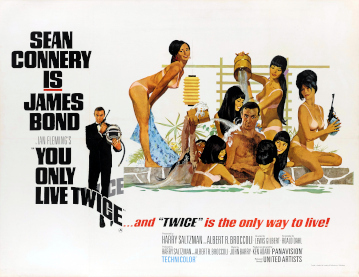 Scripted by the famed children’s author Roald Dahl, ‘You Only Live Twice’ starts strongly enough, with Bond supposedly killed and an eerie sequence in space where an astronaut is cut off from his spacecraft, left to drift out to his death. This is the first film in the series that really brings SPECTRE out into the open, with the script spending more time in the lair of their designated Number 1, Ernst Stavro Blofeld, played here mostly unseen by Donald Pleasance. The plot revolves around SPECTRE orchestrating a conflict between Russia and the US amidst the Cold War by causing spacecraft from both countries to mysteriously disappear. As the spacecraft landed off the coast of Japan, the British suspect Japanese involvement and Bond is sent across to investigate. His investigations lead him into contact with the Japanese authorities (and the obligatory love interest, played here by Akiki Wakabayashi), as they discover that SPECTRE and Blofeld are the ones behind the various incidents. The film unfortunately becomes more and more far fetched after a promising opening, with it reaching its peak with a lengthy sequence where Bond undergoes training and a makeover to ‘appear’ more Japanese, which of course looks utterly ridiculous. ‘You Only Live Twice’ isn’t the first film in the series to rely on gadgets, but it’s the first film where their use starts to feel excessive and at the expense of tight and clever plotting. Gadgets are an important feature of the Bond series but they do lend a more cartoonish aspect to proceedings, and this feeling is enhanced in ‘You Only Live Twice’ by the increased screentime with our primary villain Ernst Stavro Blofeld. Blofeld has become the standard go-to supervillain for any parody, with the likes of ‘Austin Powers’ Dr.Evil in particular based on the character, and this has served to lessen his threat in the years since his original appearance. Judging just how effective Blofeld is as a villain 50 years down the line is more challenging as a result, and whilst Pleasance’s portrayal and appearance is slightly hammy, it still retains a certain menace. With that being said, I can’t help but feel SPECTRE felt more of a threat as a secretive organisation operating in the shadows, than when they were brought to the forefront. The theme tune is particularly memorable, although in my ignorance I didn’t realise that it had been heavily sampled by Robbie Williams for ‘Millennium’ several years ago! ‘You Only Live Twice’ is not a bad entry in the Bond series, but it’s certainly one of Connery’s weaker outings, and the reliance on gadgets and more cartoonish nature would be taken to the extreme once Roger Moore became settled in the role.